I have been using my Samsung Epic 4G for several months now. Aside for the repeated delays in the Froyo 2.2 update, I really like this phone. What an improvement over the Palm Pre! With all my running around in December, I found several Android Apps which really help made my life easier, especially in New York City. 1. Google Maps 5.0 Update with a built-in Compass! Google released a significant update to Google Maps in the Fall of 2010. This update will not automatically apply to your phone. You will need to find it in the Android Marketplace and install it. But, a recent update made it even better – there is now a directional compass built-in! Just click the My Location button in the upper right hand corner of the Map and the symbol changes into a compass. As long as you have a good GPS signal, Due North will be indicated and as you turn, so will the map. Just brilliant! Some Android phones (like the Samsung Galaxy S line) can even combine this with a 3D tilt view for a real jaw-dropping effect. You can read more about the latest Google Map update here. While you are installing this update, be sure to check “Allow automatic updating” to be sure future enhancements are also applied. You can even add Street View on Google Maps, also in the Android Marketplace. Have you ever wanted your Android phone to automatically change settings based on your location? It’s a great idea – have one set for the office, one for home. Two popular Apps, Locale and Tasker, will do just that for a $10 fee. However, did you know that there is a FREE App which will also work? It’s called Profile Valet and it’s very simple to use. In the above example, I am using Profile Valet to automatically turn on the WIFI, based on the stored GPS location of my home. According to the developer, this is a 500ft radius from the stored location. I now leave my WIFI turned off to extend the battery and use Profile Valet to turn WIFI back on when I walk in the door. 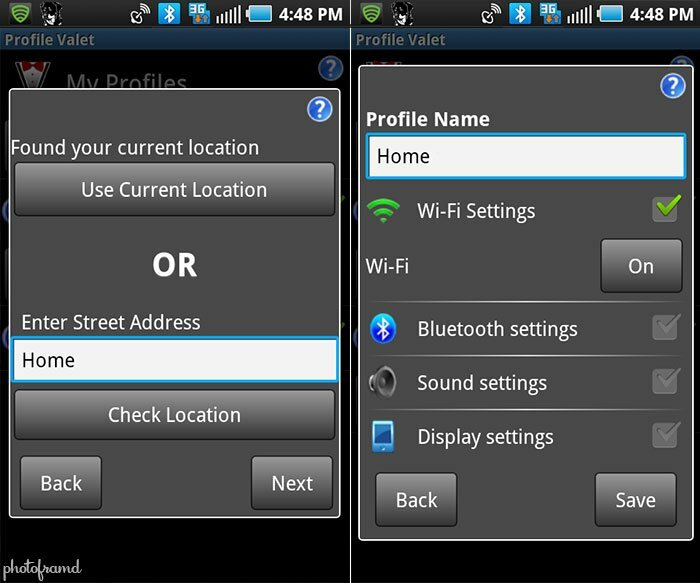 Profile Valet will also customize Bluetooth, Sound and Display settings. Pretty cool! 3. 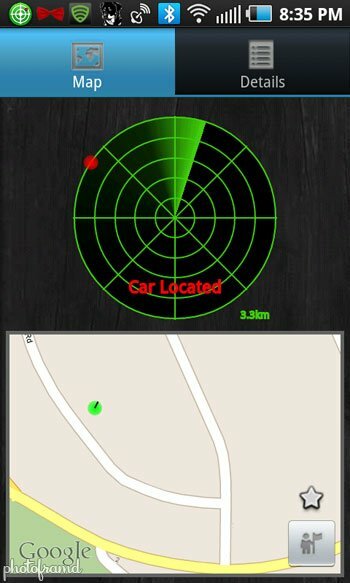 Car Locator with Bluetooth Plugin. Wouldn’t it be nice if you could just park your car and have your Android phone remember where you left it? There are two Apps which will do just that – Car Locator (shown here) by Edward Kim and Car Finder AR by Hexter Labs. Both of these Apps require you to install the main program first and then install its Bluetooth plugin (both directly from the Android Marketplace). Car Locator was featured in Verizon’s recent Holiday commercial where a group find their car during a snow storm. When you turn off your car, the Bluetooth connection to your Android phone is severed. The Bluetooth plugin detects the dropped connection and requests an updated GPS location which is then stored in the App. When it’s time to find your car, you just run the App (with a Google Map view) to locate your car. You will probably want to download both Apps to see which one works best with your phone’s GPS. (Car Locator worked like a charm, but I had repeated problems with Car Finder AR on my Epic 4G). Just look for the Icon in the phone’s Toolbar when you turn off your car. There are a few Apps in the Android Marketplace that offer caller id. But, be careful. Most of these Apps like Whitepages with Caller ID are actually short-term licenses which will need to be renewed. Supper Caller ID by InnovaMentis is different. It’s just a one-time fee. It does require an active WIFI signal to perform the look-up while the phone is active. It also can not retrieve the party’s name if the phone is unlisted. 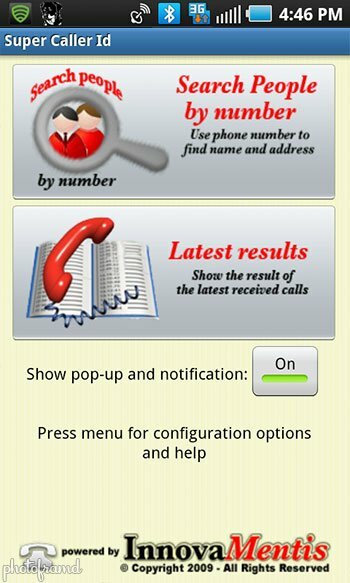 However, when the phone rings, it will display any available info about the caller that it can retrieve (at least the caller’s city & state). The App also includes a free reverse White Page look-up to manually research any phone number. Many of the Android blogs love to bash Advanced Task Killer by ReChild as a battery killer instead of a battery saver. The argument goes something like “It takes more battery power to end an App than it does to let Android manage the App itself. And, many times the App will spring back to life after being killed, draining even more battery power.” Froyo 2.2 severely limits the capabilities of task killers anyway, so something new is needed. Enter Watchdog by Zomut. It is a task monitor which will alert you to excessive CPU use. You can use the automatic settings or set custom threshold levels yourself. Since this App is always running in the background, I was concerned that it could turn into a battery drain itself. (There have been a few reviews for System Panel by NextApp which have complained about the battery drain from monitoring too many programs.) So far, Watchdog has been great. 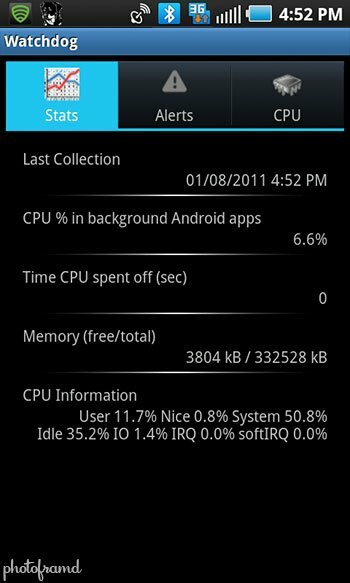 It flagged an App for excessive CPU use and its monitoring uses a minimal amount of battery power. 6. Photo Tools by hcpl. Photo Tools by hcpl is a must for any Photographers and it’s FREE (with ads, of course). 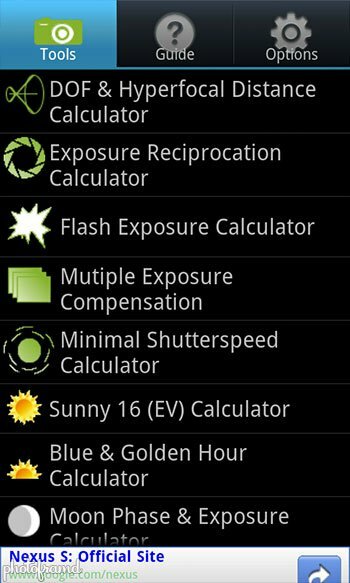 It includes several calculators which can be customized for your type of camera like DoF/Hyperfocal Distance Calculator, Exposure Reciprocation Calculator, Flash Exposure Calculator, Image Histogram Viewer, Sharpening Radius Estimator, Sunny 16 Calculator, Sunrise/Sunset Calculator, Moon Phase/Exposure Calculator. There are a few Apps which charge for such info, but this one is FREE and it’s in the Android Marketplace. No New Yorker would ever be caught looking at a Subway Map. 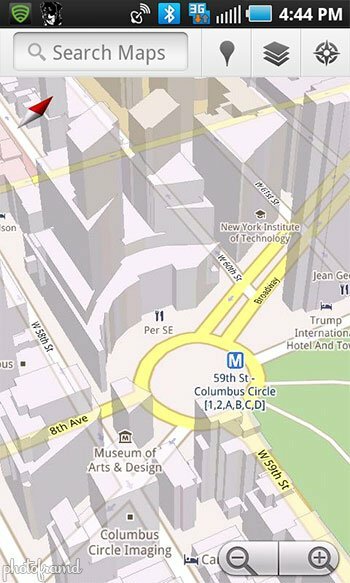 Not that we always know where we are going 😉 NYCmate lets you carry this map on your Android phone (see the image on the left). It even ties into the Google Transit Status info (as long as you have an internet signal). It does not have a GPS locator though, so it can’t find the closest subway. Visual IT (the maker of the Tubes for Palm, Symbian and Windows Mobile) just released New York Subway 10 in both a free Lite version and paid version. This App does use your phone’s GPS to find the nearest subway and also provides subway status info. It will even plan out a subway route for you – just set your start and end points. Not as easy as the Tubes, but it works. If you are interested in this Visual IT App, be sure to download the free lite version first. 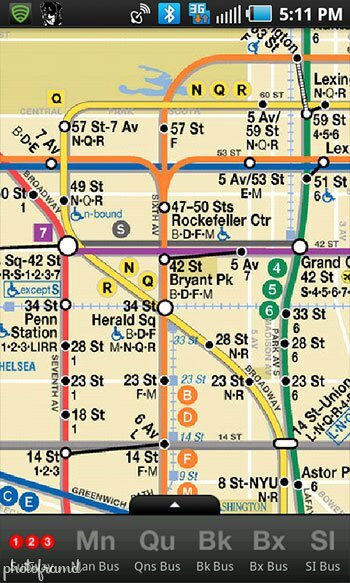 Some users have complained about the “non-standard” depiction of the subway map as being confusing. The map also does not support multi-touch zooming but does provide magnifying icons to zoom in and out. Next → Next post: Verizon iPhone 4 – Things to consider before signing up!